It is difficult, if not impossible, to imagine coming off the ground after an afternoon's toil in the sun or otherwise, hopping in your car and going straight home. What a terrible thought! Definitely not cricket, sorry baseball! There are clubs that place so much emphasis on socialising that whatever sport they are involved in plays second-fiddle to enjoying the company of the opposition and their team mates. Conversely, there are also clubs where the game result is everything and social activities are at a premium. Fortunately, such clubs are in a minority. The lads at Frankston Baseball Club have always accepted a play-to-win policy whilst on the ground, yet somehow seem to muster their extraordinary reserves of energy to enjoy themselves afterwards. Their rule seems to be: if the opposition can't last the distance, we certainly will! In the early days, facilities at the Club were not as developed as they are today. Six o'clock closing resulted in players rushing down to the nearest 'Watering Hole' in order to enjoy a few drinks with the opposition and team mates. As Club facilities developed, the Club was the spot, despite the likelihood of a visit from the district Police Inspector. Players would assemble, with minimum lighting and despite water dripping through the roof, would enjoy a few 'samples' of the 'good drop.' In order to ensure that the Club was not visited by a member of the law, a 'Cockatoo' (a lookout) was posted at an appropriate position. House Parties were very popular in the early and mid 1950's, and gatherings in excess of 60 people regularly assembled at the homes of Rod McClelland, Clarrie Curwood, Mrs. McDonald, Geoff Drough, Gordon Jeffs, Ray Chapple and Brian Jack, in order to dance the night away. Bill O'Brien, the father of John and Paul, had eagerly awaited the first A Grade premiership flag. When the team won the 1953 pennant, they celebrated at the now-closed 'Cloverleigh.' Celebrations for the 1957 and 1962 flags were held at the Pier and Grand hotels respectively. Barbeques were held on Field Game Days and teams from Richmond and Collingwood were invited to join in the festivities. 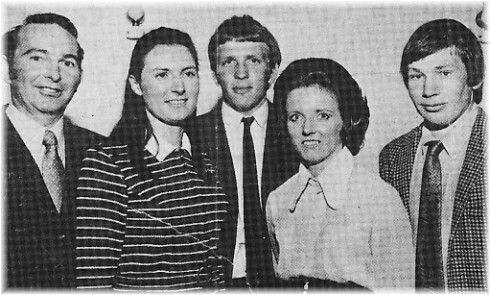 Brian Jack built a large barbecue for the Club which proved to be an asset as far as team gatherings were concerned. In the early days trips away to Bendigo and Geelong were arranged by such senior players as Clarrie Curwood, Alf Burridge and John O'Brien. Apart from social games between the various clubs, these trips provided an opportunity for families to pack the picnic basket and enjoy themselves. Today, not a great deal seems to have changed as far as the post-match activities are concerned. After the traditional shower and something to eat, the lads congregate at 'The Patch' (the bar), and it is on! Baseball, football, politics (sometimes), the working week and its problems and successes, are topics that are discussed with enthusiasm. If there was nothing organised at an alternative venue, the lads would generally outlast the opposition at their favourite pastime - chatting and drinking. Thursday night is traditionally 'Selection Night' where the 'Selectors' perform all sorts of miracles in ensuring that each senior team has a full list of players for the following Saturday's round of matches. 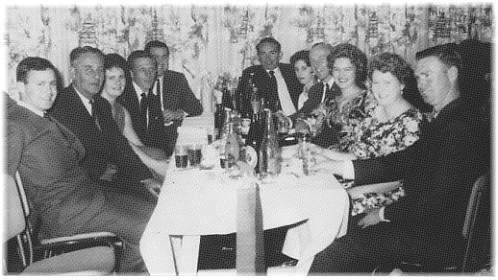 The range of social activities held at the Club over the years has been extensive - dances in the Mechanic's Hall (with Cook's Orchestra), BBQ's, dinners, fancy dress nights, car rallies, trips away, disco's, fashion parades, player auctions, talent quests, beer and wine tastings, trivia nights, cocktail parties, a bad taste night, and smoke nights - and have either originated at a Committee level or on an impromptu basis. On many occasions, the morning-after-the-night-before was not looked upon with a great deal of enthusiasm by many of the participants, particularly if a Sunday game had been scheduled. The lads from the Frankston Baseball Club have over the years seriously challenged the law relating to mixing baseball with the consumption of various forms of alcohol. Whilst there are players who would never touch a drop before a game, there are quite a few who have arrived at a venue resplendent in their uniform, but 'suffering' from a variety of maladies usually associated with a wee dash of over-indulgence! Provincial Carnival trips have provided yet another opportunity for Frankston representatives to 'enjoy themselves.' Some of the 'exploits' of Dandenong Baseball Association representatives border on the lines of unprintable. The fact that the Dandenong Baseball Association were Senior Champions from 1990-92 is something that defies description. The annual Presentation Night is generally the final activity in the Club's social calendar for the year. Over the years it has been held at the Club, various hotels, the Long Island Golf Club, and more recently, the Peninsula Estate Winery at Red Hill. In the case of the last venue, participants have travelled by double-decker bus, an imminently sensible idea. The return trip to Frankston was a fun time, particularly after a night of wining, dining, dancing, and presentations. Frankston Baseball Club has always been a very social club and one where visitors are made welcome. Apart from a variety of senior team activities, the Junior Teams have attracted a large number of parents and friends to their activities, in particular Presentation Nights. The Club has actively promoted the involvement of family members with the result that many players and their families have maintained their association with the Club for many years. ... Ray Chapple insisted on an Attendance Book being signed after each practice session. ... During February 1969, a "Mystery Beach Picnic" was held as a social activity. ... "Little Tatts" was used as a fund-raiser. ... Peter Finney (Club Coach in 1970 and Under 15 premiership Coach in 1987) played in the 1966 Chrysler Cup in Adelaide in company with such players as Rod Owen, Ross Straw, Alan Tanner, Keith Whitford and John Wadsworth Jnr. ... Mick Fletcher, a former player, was a former Olympian (Yachting), and America's Cup Advisor and is now a Commentator on the Sydney to Hobart Yachting Classic. ... Joffre Metcher, was one of Freddie Dawson's (former world lightweight boxer) chief sparring partners. ... Bob Nichols, a former player and now an American citizen, was Advisor to Presidents Ford and Carter on Nuclear Physics. ... Vietnam Veterans were Chris Atkins, Geoff Hawker & Ross Teschendorff, players of the 60's. ... Bill Souter was also a cricketer of note, being a member of the Victorian Sheffield Shield Second XI. ... The O'Brien Medal is named after former Frankston player/official - John O'Brien. ... Peter Gloury became the first Property Steward in 1973. ... Cost of a full uniform in 1974 was $15.00 Subscrptions for senior players was $20.00 (plus a match fee of 40 cents) and juniors $10.00. ... John O'Brien, when umpiring, would break up fights by swinging his umpires mask around his head! ... In 1979, former umpire, John Crichton, was presented with a pair of spectacles - for a variety of reasons! ... 1985 Special Award Winners - Jim Prokhovink (Most Irregular Player), and Jim Ferron (Special K Award). ... Stewart McClelland (younger brother of Rod) was nicknamed "Steamboat" as he regularly enjoyed a quiet smoke in the outfield. ... The late David Smith could not be accommodated in Clarrie Curwood's truck one day, so he rode his bicycle all the way to the Springvale ground for a game. ... In 1955 Rod McClelland rolled his father's car on his way home. Unfortunately, it also crashed through the front fence of the local member of the Police Force! ... Norm Tindall, one of the original players at the Club and still living in Frankston, was Captain of the VFA team that competed in the 1953 Carnival Series. ... Les Hyde was known as "The Pocket Snatcher" as he often (accidentally?) held runners on first base by grabbing their pocket! ... Paul Duncan had thirteen consecutive safe hits in C grade games against Monash and Dandenong Valley during the 1992 season.